Here is yet another outstanding album from one of the finest trip-hop acts in the industry. 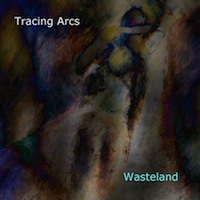 Tracing Arcs, founded in the mid ’90s, gives us Wasteland. In this ten-track collection, musicians Fran Kapelle (lead vocal/backing vocals/lyrics) and Paul H. Addie (keyboards/programming/guitars) treats the listeners with a premium blend of jazz, downtempo beats, and some mellow electronic. The album also features special performances by Violet M. Williams (backing vocals) and Phil Brammer (guitar). Starting things up is Closer to You, a spacey electronic piece that incorporates extending, sharp guitars with some powerful arrangement. The track spins a dark core and reverberates its edginess in our ears. Fusing jazz musings and downtempo harmonies, Unravel the Thread is the ultimate chill pill. Float in precise as harmonies as this piece gives you a steady sonic high. Walk Across the Wasteland utilizes a lot of technical wizardry and some glowing synth undercurrent. The combination of spacey, atmospheric vocals with Fran Kapelle’s smooth and sharp vocals is truly bliss. While Homecoming is a sublimely relaxing yet complex musical piece that demands you to chill but not to the point that you’ll flow asleep. What makes this piece successful is because of Tracing Arcs‘ use of subtly in all aspects–the hushed, lounge-y arrangement and Kapelle’s soulful delivery. Wasteland has once again proven that the are, and will always be, powerful mainstays in their chosen genres. The fluidity and flawlessness of each piece allows the listener to a pleasurable listening experience that’s worth the repeat. Aside from creating great music, Tracing Arcs is kind enough to release this album under Creative Commons Licenses. So go ahead, download this gem and embark in an ambient musical journey. The Weepies: Who the hell are The Weepies?